Sylvester Stallone and his ragtag team of ageing action heroes return in The Expendables 3, the third and potentially final entry in the increasingly preposterous, testosterone-fuelled franchise. 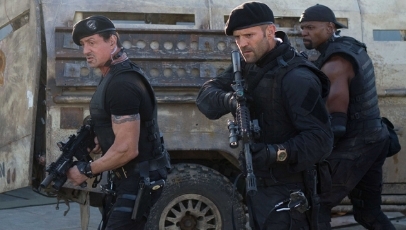 Under the helm of Red Hill director Patrick Hughes, The Expendables 3 finds Barney (Stallone) up against old partner-turned-foe Conrad Stonebacks (Mel Gibson), this time with some new, younger and more tech-savvy mercenaries along for the ride. As audiences have likely come to anticipate from the previous two films, there’s not much to The Expendables 3 besides relentless action and mildly humorous character interplay. Returning stars Stallone, Jason Statham and Terry Crews all have their moments, but it’s series newcomer Antonio Banderas who steals the show. The script though, penned by Stallone, Katrin Benedikt and Creighton Rothenberger, is so limp and transparent that it’s almost laughable, and Hughes struggles to make his mark in the directors chair. There was once a time when the idea of seeing action heroes from all walks of life bandied together was an entertaining prospect. That time has long past if The Expendables 3 is anything to go by. Cogent summary. Having read this I think my own review has too much libel, but I feel that the cast are tough-skinned enough that they wouldn’t hurt me if they saw it.